With the upcoming release of the brand new Air Jordan 33, one of the world’s premier basketball footwear brands will be starting its newest chapter centered around Nike’s cutting edge FastFit technology. Much like other heralded silhouettes throughout the Jumpman’s illustrious lore – the likes of the iconic Air Jordan 3 – the 33 boasts its FastFit technology as a part of its aesthetic make-up, abandoning the idea of a conventional lacing system for a newly engineered lockdown fit. FastFit makes the wearer’s life easier in three simple steps. 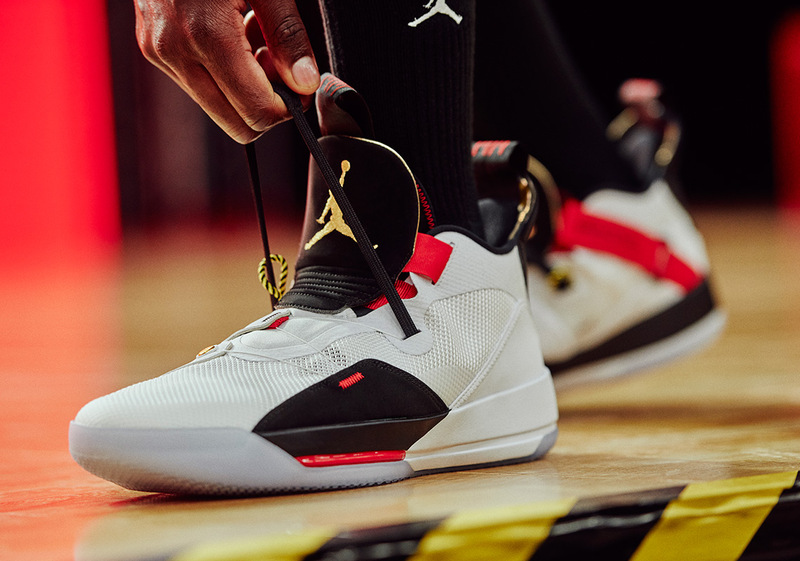 First, its tongue and heel loops allow for easy entry, then a tightening system is activated by a lone tug on the “Pull To Lockdown” forefoot strap that was previewed by the Jordan Brand last week. Finally, when the game concludes or a tireless workout has come to and end, all one has to do is pull the sneaker’s side loops to eject. This process was designed with the ease of the consumer in mind, meant to be repeated during the game if the fit needs to be adjusted. Utilizing design ideas from the brand’s legacy, its translucent window to its tightening system references the Jumpan’s original Air window, while its Nike Air heel branding harkens back to the Jordan 3 through Jordan 6. Under the hood, the 33 combines Jordan Brand’s Flight Speed technology and a Nike Zoom Air unit in an effort to propel it to the top of today’s hoops-engineered sneaker pantheon. Jordan Brand will launch the Air Jordan 33 on Jordan.com and at other select basketball retailers on October 18th. Grab a detailed look at its introductory colorway below as well as numerous design sketches that helped lead to the genesis of this evolutionary basketball model.